Jay began to learn to cook at a very young age in his mother’s and grandmother’s kitchen. Curious by nature, he would ask many questions of why certain food was prepared at a particular temperature, why certain spices were used in only certain dishes, and how baking required all new and different ingredients as well as equipments. Hardly, he realized his hobby turned into a profession. Being a self-starter and versatile, today he creates traditional and international dishes to introduce new items to cater different cultures and not limit to East Indian cuisine and population only. Over 8 years of professional cooking experience, he blends his culinary education and work from Toronto and Calgary to introduce fresh, new ingredients and healthy cooking menu for takeout, catering, bakery, and other unique dishes. Jay wants to reach new heights by introducing fusion menu in international cuisine. 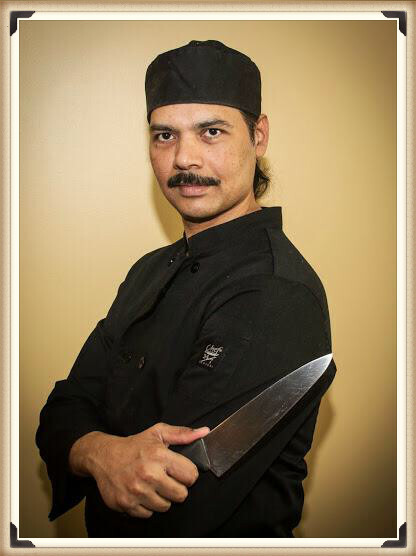 Having worked at Ricky’s All Day Grill, with Mango Shiva, Indian restaurant and bar, Calgary downtown as well as restaurants in Toronto gave him extensive experience to prepare ala-carte dishes at various stations and cater for big crowds. He holds a Sous Chef Certificate from Toronto and has his Food Handler Certificate to ensure high standards of safety, health, hygiene and sanitation in the preparation, handling, and serving of food.